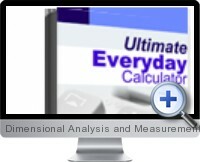 Dimensional Analysis and Measurement for Excel is ideal for estimating, calculating, converting measurements or working with geometry. Integrated with Microsoft Excel, it walks painlessly through calculations that help solve common statistical and dimension measurement problems. Conversions for temperature, metric liquid and dry measures. Statistical calculators for sports and other probability analysis. Construction and renovation formulas for wall framing, stairs, painting, adding drywall, bricklaying and more. Common measurements and estimates of calculations such as amps, degrees, wind chill factors, land areas, square feet, board feet, time, distances and speeds.